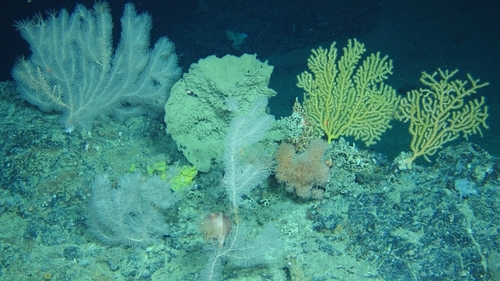 Scientists from the Marine Institute have discovered cold water coral reefs at previously unexplored depths off the west coast. The findings came about as part of the latest expedition at the furthest reaches of Irish waters. Over the last three weeks the Irish Lights Vessel, Granuaile, has been used to carry out deep water explorations along the Porcupine Bank. Researchers covered over 1,000 nautical miles, using the Holland I Remotely Operated Vehicle (ROV) to carry out round the clock surveys of the sea bed. The ROV is fitted with LED lights, high definition cameras and a range of tools that allow it to film, measure and gather samples at depths of up to 3km. Scientists found a coral reef known as Solenosmilia variabilis during the voyage. It was located 1,600 metres below sea level, deeper that it had ever been recorded before and in much more sizable formations. Chief Scientist on the expedition, David O'Sullivan, said the find was extremely important, especially due to the rate at which the coral grows. It takes around one year for it to increase in size by one millimetre, so the reefs could be up to 4,000 years old. After the Granuaile docked in Galway this morning, hundreds of samples were unloaded and taken to the Marine Institute and to NUI Galway for further examination.